There are many hidden gems that sparkle along the north coast of Ohio, but none more delightful than the small town of Lakeside. Nestled along the northern shore of the Marblehead peninsula, Lakeside is 80 miles west of Cleveland and 60 miles east of Toledo. Founded over 135 years ago, Lakeside still proudly maintains many of its century-old historic buildings. Established originally as a Chautauqua, it is one of only four that have continuously operated since the 1800's in the United States. From May through September it operates as a gated community and a daily admission fee is charged. 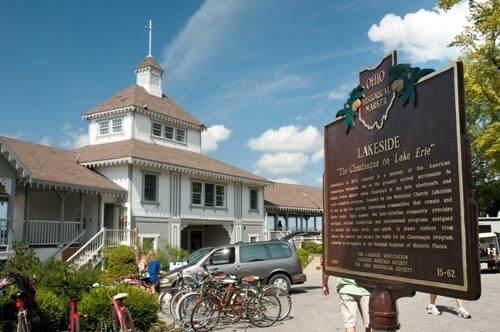 The fee, while far less expensive than the more-famous New York Chautauqua, gives the visitor unlimited access to Lakeside’s programs, entertainment and day-long shuffleboard. See the complete article on Examiner.com with a 55-image slideshow.